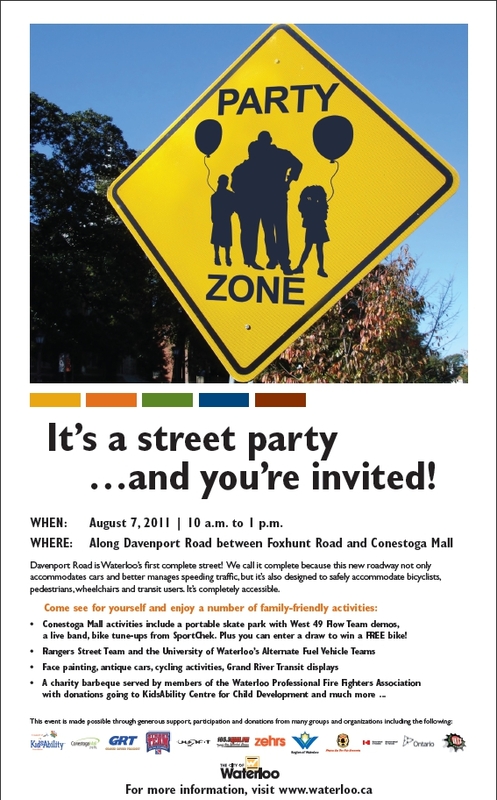 Spreading the word (again) as my neighbourhood association passed on an email from the City of Waterloo with a poster for August 7th’s Davenport Street Party (10 am and 1 pm) and a notification that Davenport Road will be closed to car traffic. Refer to the cities website for more details of the project. Reading the fine print makes it sound enticing … free bike tune-up from sport chek (well it’s better than no tune-up and I’ve got four bikes to pick from), draw for a free bike, skate board demo from West 49 Flow team (video clip is cool) and a charity bbq! Print off the poster and tack it up somewhere! Have they painted the bike box on at Lexington yet? I haven’t seen one painted yet. Do you know where it’s going down? Corner of Lex and Davenport? There’s nothing there yet. I really like the way this road turned out. I remember a lot of speeding going on that road when it was 4 lanes. Now it looks more like a smaller residential road and less like an avenue. Wish the region would apply this treatment to other roads.